Specifically, devise schedules and an arrangement for two electromechanical 24&hairsp;-&hairsp;hour light timers to control the flow of power from an outlet to a light bulb. The challenge is to obtain the following repeated lighting pattern with the largest possible number D, while N is a nonzero constant other than 24&hairsp;−&hairsp;&hairsp;D&hairsp;, beginning when the outlet's power is switched on. The example above shows much of what is allowed, although one timer is missing. Each timer repeatedly cycles through its schedule of 24 intervals that last an hour each. A socket multiplier is not strictly a one-way component. Power can flow out through its plug and in through its sockets. This even allows for power to flow between pieces plugged into a multiplier's sockets, whether or not the multiplier is itself plugged into anything. When the timer is ON (in a time interval where the switch is closed), then the light can be powered in reverse (supplying power the "wrong" way). When the timer is OFF (in a time interval where the switch is open), supplying power the "wrong" way does nothing. Whether or not the timer continues to click will depend entirely on whether or not the timer is powered from the "right" direction. When the timer is transitioning from ON to OFF or vice versa, if the timer is not powered from the "right" direction, then maybe it will just blow up. So it always has to be powered from the right direction during a transition, but may be powered from the wrong direction also. D=12, N=4, although I'm not sure that this is the best solution you can get. 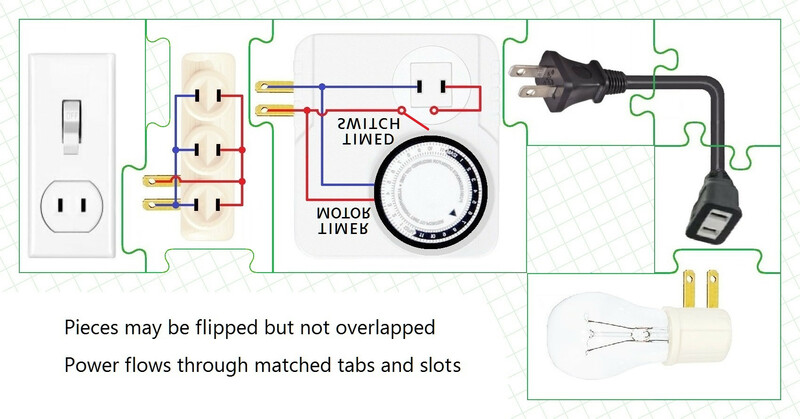 Which involves 2 socket multipliers, 1 wire (male-to-male), and the outlet-timers-light setup. In this setup, the light will be on when either timer A OR B is set ON, and only off when both A and B are set OFF. This basically puts timer A on a 32 hour cycle, since it will become unpowered for four hours at 2am and 2pm every "day". And since timer B is essentially on an 8 hour cycle, it behaves exactly the same through each cycle of timer A, we don't need to worry about them becoming de-synced. The 32 hour cycle of timer A is below. I've put dots above each hour when timer B will be off, and parentheses around all the hours that timer A will be off; the light bulb will be on only when these coincide (the hours indicated by a hyphen). We start with an on-time for 10 hours. Next timer1 will be off for 12 hours so timer2 won't move. Then timer1 will switch on for 12 hours (starting at intervall24) and timer2 will go through 12 hours off-state. Timer1 will switch off for another 12 hours. Finally timer1 will switch on again, run for 1 hour during intervall24 and starting with intervall1 timer2 will also switch on thereby closing the cycle. 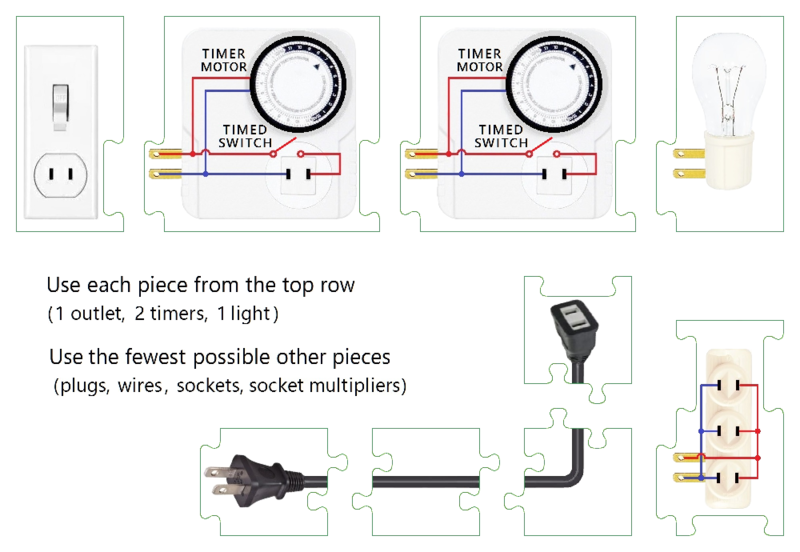 This obviously works because one timer acts as a wire and the other as a 11-on, 1-off timer with 12-hour period. I claim that no period of daylight over 11 hours can be done with a non-24 hour cycle. First, let's look at the possible circuit diagrams up to circuit topology (assuming that the timers are connected to the main circuit at both sockets). Let's work backwards. The 5th diagram shows the light being completely on - $D=\infty$, $N=0$ (but I don't think that counts). The directionality of the timer doesn't matter. The 4th diagram shows the light always on as well - $D=\infty$, $N=0$ (again, I don't think that counts). And again, directionality doesn't matter. The 3rd diagram shows one timer being bypassed - so the light is dependent on only one timer. This can give us at most $D=11$, $N=1$ (given how we set the non-bypassed timer). If the non-bypassed timer was backwards with respect to the image at the top of this post, it wouldn't reliably be able to turn itself off and the light would be constantly on. The 2nd diagram shows two timers in parllel - this means that the light will be on with the effect of a single timer - the result of timer A && timer B. This can give us at most $D=11$, $N=1$ (given the net effect of timer A && timer B). If one of the timers was backwards, again, it wouldn't be able to turn itself off and the light would be constantly on. Finally, we have just one circuit to work with - the one with two timers in series. None of the timers can be backwards because otherwise they couldn't reliably turn themselves on/off and they wouldn't be able to switch out of their initial state-leading to either a one timer problem ($D=11$, $N=1$ best) or a permanently fixed state light. Assume $D>11$. Then because hours are discrete, $D\ge12$. First, the two timers each have just one ON period (maybe spanning 24-1) - we will now prove this. If the light is on during an ON period, the period must be at least 12 hours long. So there can't be two ON periods where the light is on. So - what is the point of the first timer having an ON period without the light actually being on? To advance the second timer! But if that was the case, we could just tack the length of the 'useless' ON period onto the end of the previous period - this actually reduces or keeps the same the amount of collisions between the first and second timers switching on/off at the same timer. Since the second timer only operates when the first timer does, the light has to be on for at least part of the time the second timer is in an ON period. The computer search didn't return any results with $D>11$. I do realise how the motor works now, so the impossibility proof is for posterity. Not the answer you're looking for? Browse other questions tagged optimization real time jigsaw-puzzle circuitry or ask your own question.